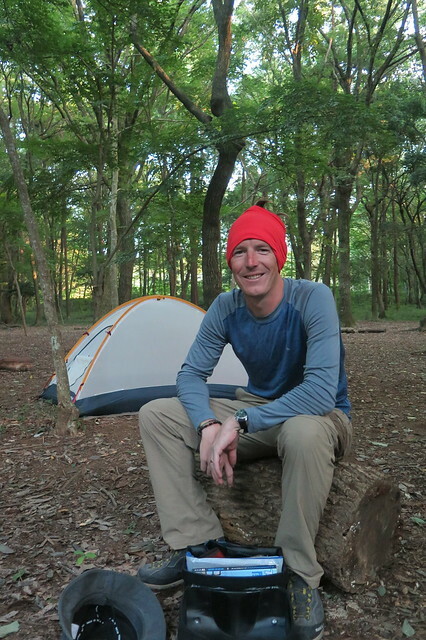 At the end of our last blog post I said we’d be pitching a tent and camping at the michi no eki in Shioya. Well, that didn’t happen. At all. Our Beatles loving friend, Mr Takeichi Banse, had other plans for us. 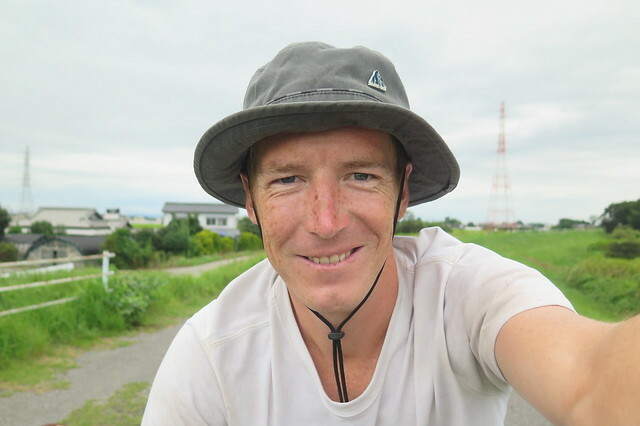 While we were sitting around poaching the wifi and generally being untidy in his immaculate visitor centre, he was on the phone to his friend in the nearby onsen hotel, arranging for us to stay there overnight on him. He came over to us, handed over the hotel’s business card and said “This is invitation. No pay.” So he locked up our bikes in a storage room, drove us down the road to the hotel and said he’d come and collect us in the morning. Amazing. What unbelievable generosity from a man we’d only had a couple of short conversations with in our very poor Japanese! 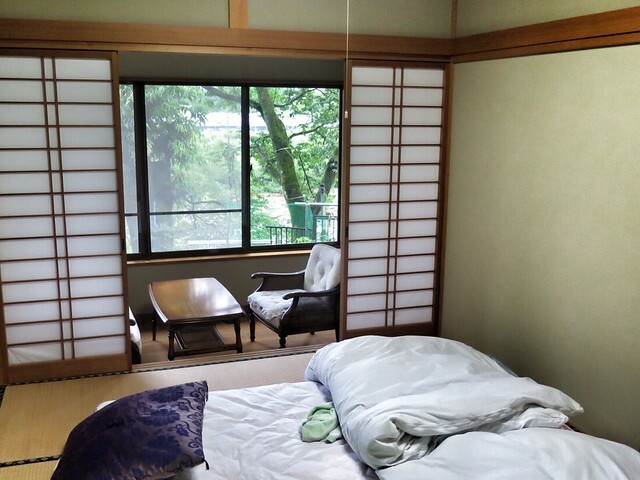 The onsen, dinner, room and breakfast were all a really unexpected treat. During dinner we were treated as special guests and plied with Asahi by the Kondou family who were friends of the owner. As we retired to our futons with slightly fuzzy heads that evening, we really couldn’t believe how the past few hours had panned out. Japan. The following morning, back at the michi no eki, the fun continued. As we were packing up our bikes, Mr Takeichi presented us with a laminated photo and good luck message, along with a bag of tomatos, blueberries and rice balls. Then, the Kondou’s from the previous night arrived and wouldn’t let us leave before they bought us a load of stuff from the little bric-a-brac market outside. Maybe not ideal as we’re limited on weight and pannier space, but very kind nonetheless. Finally riding away from Shioya mid morning, we were on a real high. Maybe it was the good vibes, or our well rested legs, but through the morning we were absolutely hauling. We averaged around 30km/h for the first part of the day, getting us to the city of Utsonomiya. 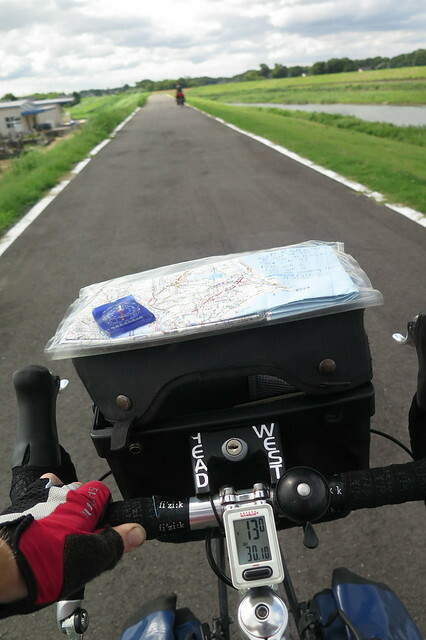 Normally, big cities are a real pain, but Utsonomiya has dubbed itself ‘Cycle City’ and is very bicycle friendly. There are wide cycle lanes beside the main roads and all the convenience stores have cycle stations with water, air and bike tools. 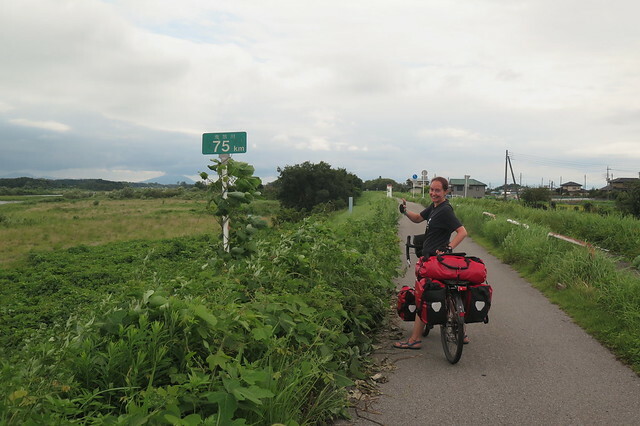 A real bonus as we were almost out of Utsunomiya was the riverside bike path that we chanced upon. Heading south, (our direction!) 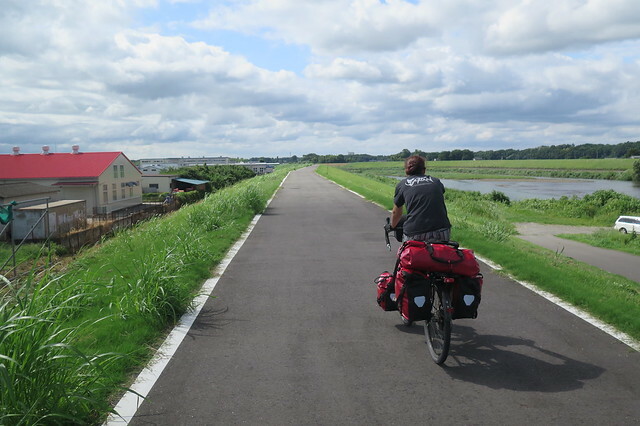 there was a dedicated cycle path alongside the river for the next 75km. Score! 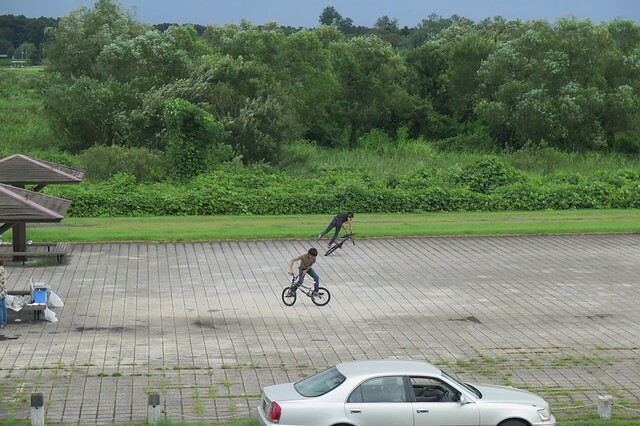 It was Sunday and in the numerous park areas next to the path we saw the locals taking part in their hobbies, ranging from baseball, to radio controlled aircraft, to flatland BMX. 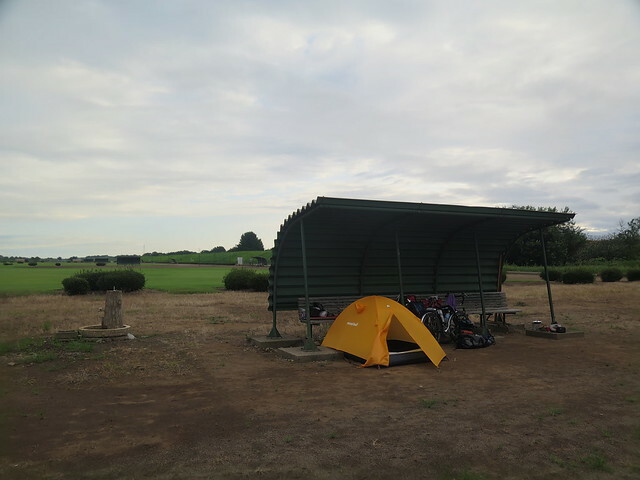 We rode next to the river for the rest of the afternoon and found a place to camp in the dugout of an unused baseball pitch near the town of Chikusei. The next morning was a sunny one, so we got up and were on the road early. 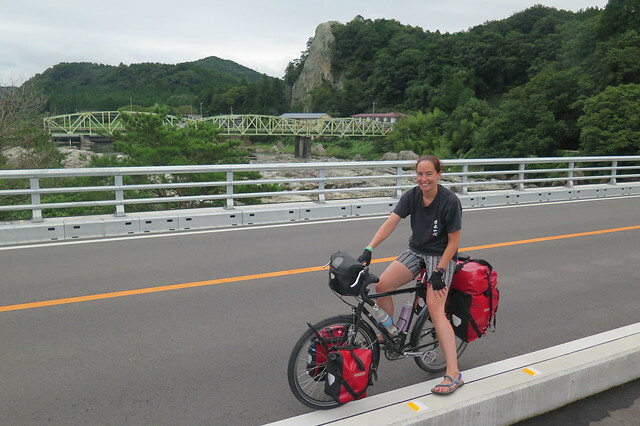 We followed the same river and continued on our way south towards Tokyo. The first 25 kilometres were great on a nice cycle path next to the river. Once we were back on the roads and we were into Ibaraki Prefecture the going was a bit tougher. We definitely felt like we were approaching Tokyo as the roads got busier and busier. Rather than compete with the trucks on the road we opted to ride on the pavements. Safer, but uncomfortable with lots of bumping up and down curbs and dodging pedestrians. 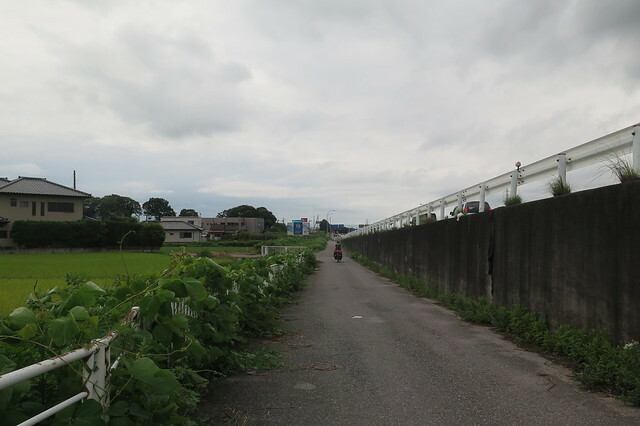 We had a lunchbreak just into Chiba Prefecture and decided to replan the route to get ourselves off the busy road. Even though it added a good distance to the day, it was well worth it and proved to be a lucky diversion. 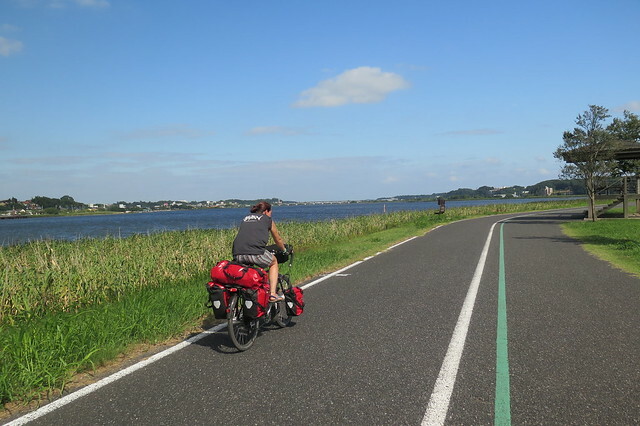 We ended up riding around a lake, with yet more dedicated cycle paths. In the afternoon sunshine all the trucks and frustration of the past few hours were forgotten. We were abruptly pulled over by a wiry old guy on a race bike wanting a chat. 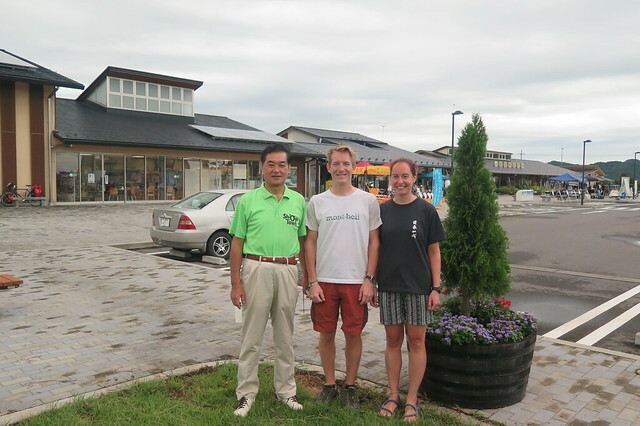 He was Mr Sato, seventy odd years old and president of the Chiba cycling club. 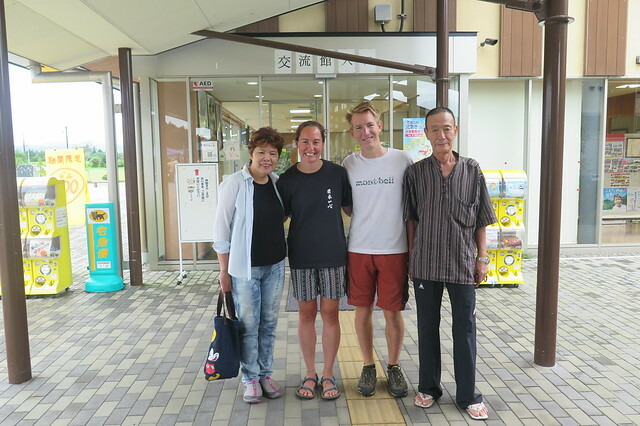 He’d been riding in Hokkaido in the summer and met a couple of other British touring cyclists (Gayle and John, maybe?) We exchanged business cards and posed for a photo together before continuing on our way. I messed up on our camp spot for the evening. I was aiming for what I thought was a public park in Funabashi, but when we arrived, it turned out to be a large theme park type thing with admission gates, security guards and no potential for a stealthy overnighter! Fortunately, a few kilometres away was a campsite. As we pulled in there, in a thick, dark forest we met the camp attendant, Mr Kizuka. We asked him how much it was going to cost us and braced ourself for the damage. He laughed and said, of course it was free! It was city owned woodland, so camping was free. We were the only campers that night, so he turned on the electricity and left us to get on with it. The mozzies were a bit hungry, but we covered up and weren’t bothered too much. Mr Kizuka was back in the morning, to give us a couple of souvenirs. 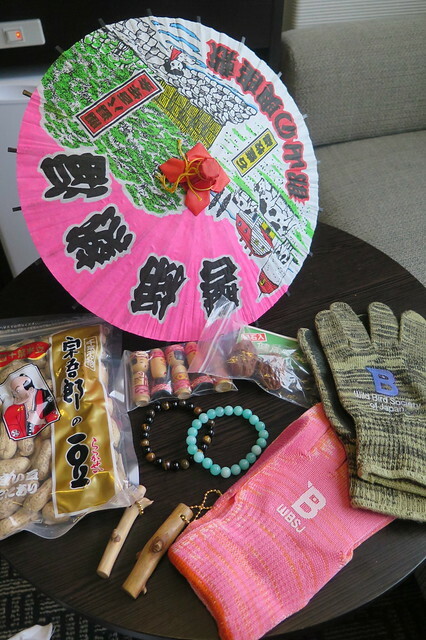 Wooden keyrings that he’d made himself, some gloves, and a bag of peanuts which are a speciality in Chiba. Yet more kindness. Back on the road, we went from a thick quiet forest to city skyscrapers within 20km. 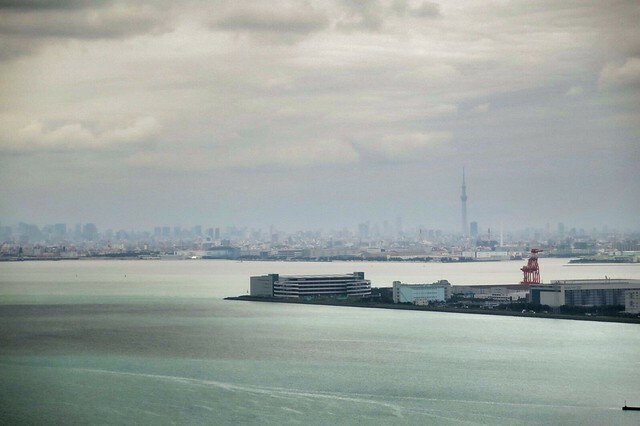 We’ve booked a hotel next to Tokyo Bay for a couple of nights. 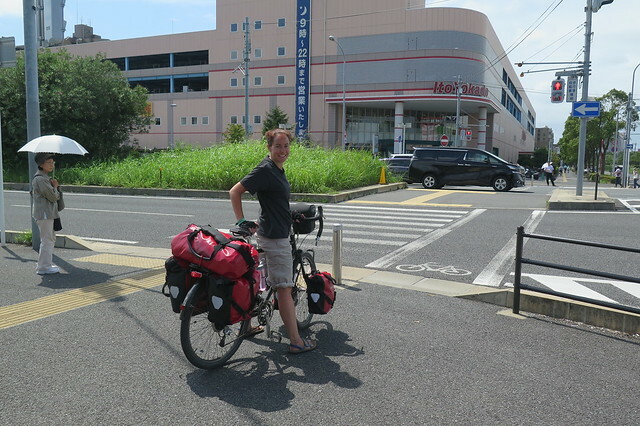 We plan to hang out, go into Tokyo, and get our stuff sorted, before riding down to Narita. 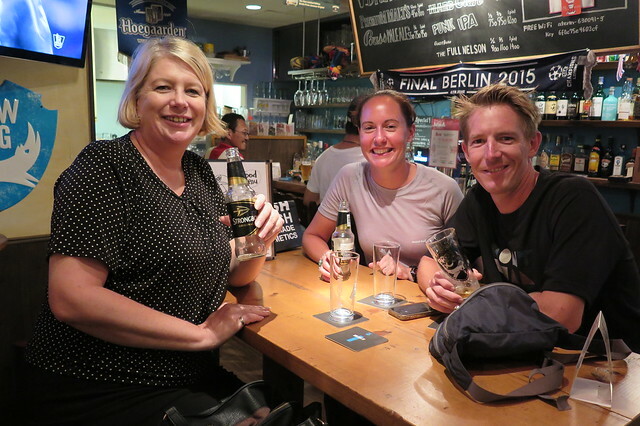 Last night we met up with another Hokkaido friend, Vanessa, who now lives in Tokyo. 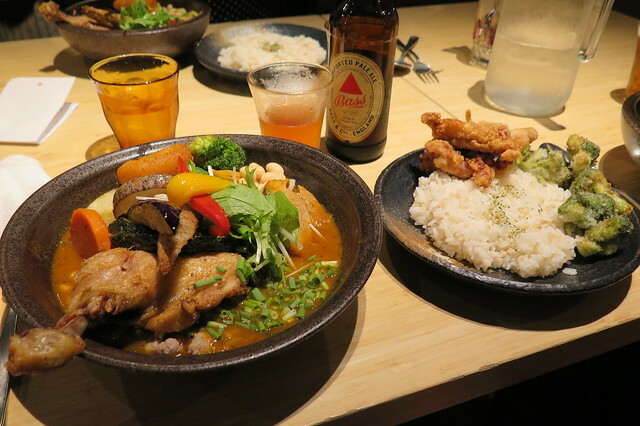 We gravitated towards a soup curry restaurant, Samurai in Shimokitazawa to get another fix of the good stuff. A couple of beers and a catch up rounded off a nice evening. Thanks for your generosity, Vanessa, and for trekking across the city to meet us on a school night! Our room here is on the 43rd floor with a great view of the bay and city. As it turns out, it was very lucky planning. We’re catching the edge of a typhoon and getting pounded with rain. We’re very glad to be in a hotel room and not in our tent at the moment! 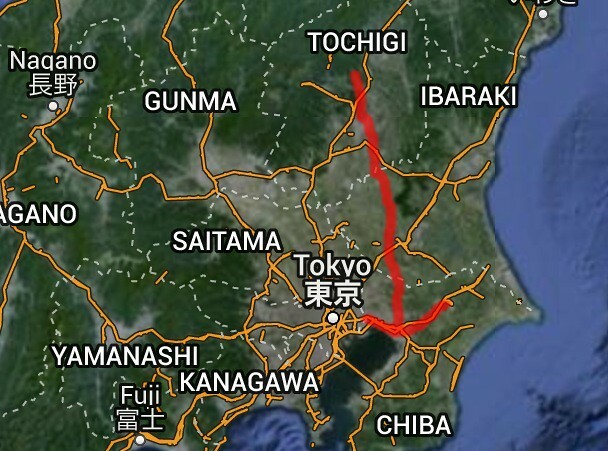 From here, we’ll ride to Narita and store our bikes and panniers at an airport hotel for a few weeks. We’ll be back in the UK for a quick trip until mid September when we’ll return and continue with the ride. 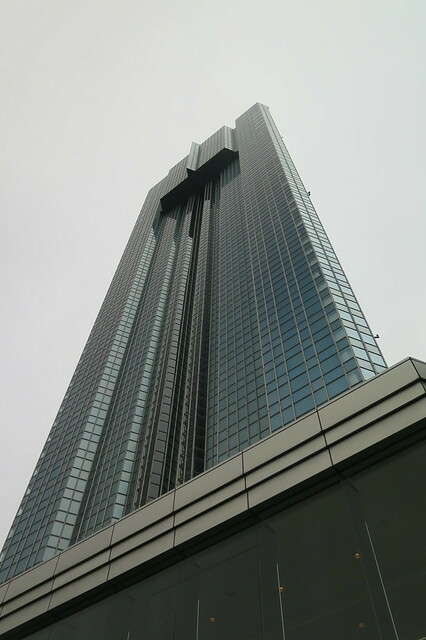 Then, the next target is Fukuoka. Our ferry to Korea is booked for October 15th. Hopefully we’ll take in a good part of Shikoku on our way down and then have time to explore some of Kyushu before leaving Japan. Thanks Gabby! 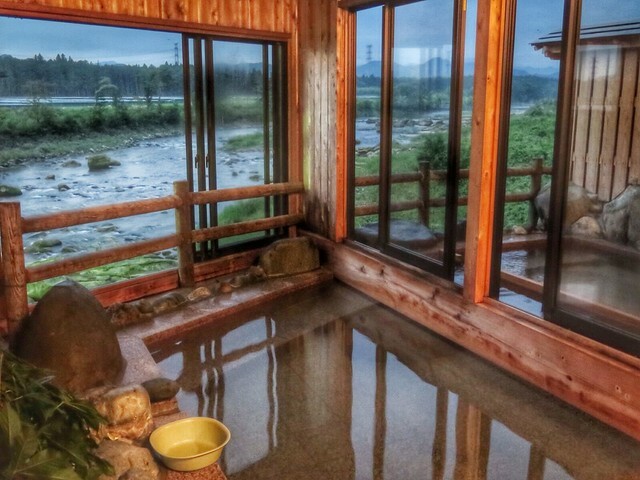 Yeah, an amazing onsen right next to the river. And such lovely people!